· Each session within the 6 conference tracks will be 90 minutes in length and contain 4 presentations followed by a discussion period. · Oral presentations must be NO LONGER than 12-15 minutes in length. If you have questions, please contact the Tetra Tech staff person indicated in your acceptance letter via email or call (410) 356-8993. If you are in need of additional AV equipment such as: 35mm slide projector with remote, internet connection, etc., you must contact Tanya Lipp at (405) 516-4972 or tanya@gwpc.org before April 26, 2002. Additional equipment charges may apply. · There will be a poster presentation area at the conference where posters will be available for viewing throughout the conference. Each poster presenter will need to be available to answer questions at their poster during a designated 30-minute block of time. Please check the conference agenda online for the scheduling of your poster’s highlight time. · The poster and exhibit hall will be open from 12:00 p.m. to 6:00 p.m. on Monday, May 20th for set up. All posters must be in place by 6:00 p.m. on May 20th. The posters may NOT be removed until Wednesday evening, May 22nd from 5:00 to 7:00 p.m.
· Each presenter will be allotted a 4' X 4' wall space area. Tape and pins are acceptable. NOTE: Those presenters submitting a full paper will have the TITLE PAGE within the paper and need NOT submit a separate TITLE PAGE document. · Papers ARE NOT to exceed 10 pages text (excluding the title page) and may contain up to an additional 4 pages of figures or tables (total number of pages not to exceed 15). · Print is to be single spaced (Times New Roman / all text 11 pt. font except title which is 14 pt. font). · Margins are to be Top = 1 inch & Sides and bottom = 0.75 inch. · Pages are to be numbered with page 1 as the first page following the TITLE PAGE (TITLE PAGES are NOT to be numbered). All PAPERS and/or TITLE PAGES OF ALL ORAL AND POSTER PRESENTATIONS must be e-mailed to tanya@gwpc.org by 4:00 pm on Friday, April 26, 2002 as an attached file in WordPerfect or Microsoft Word. Proceedings on CD will be made available to each registrant of the conference. See an example of a correctly formatted TITLE PAGE . The conference agenda will evolve as we move closer to May 20th. 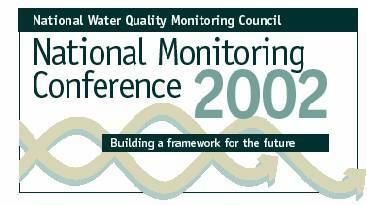 Please refer to the conference web site at www.nwqmc.org for the LATEST preliminary agenda. The preliminary agenda is subject to changes. If you have verbiage changes to the preliminary agenda regarding your information (e.g., presentation title, authors), please notify Tanya Lipp at (405) 516-4972 or tanya@gwpc.org as soon as possible. The FINAL agenda will be set two weeks prior to the conference. · Conference registration fees for oral and poster presenters will be reduced to $100. All presenters must submit a completed registration form and pay the reduced fee. Please visit www.nwqmc.org for online registration. Registrations should be submitted by May 10, 2002. · Hotel reservations are the responsibility of each participant. Please visit www.nwqmc.org for detailed location/accommodation information. NOTE: The weekend preceding the conference (Friday, May 17 – Sunday, May 19) is commencement weekend for UW – Madison. With this in mind, it would be wise to make hotel reservations as soon as possible. · We will provide you with 10 conference announcements to distribute to those who may be interested in attending the event. Tanya Lipp at tanya@gwpc.org (405-516-4972) by 4:00 p.m. April 26, 2002.